There have been some great entries in my sunglasses giveaway! Don't forget to check it out and enter as it ends Friday. Over the summer, I've found I've worn very similar outfits so I've had no problems grouping pictures together to post. Shorts and kimonos have become a favourite with me this season, and you can't go wrong with a good grey tee! I've mentioned before that if I'm wearing a top in one colour, I'll usually wear a jacket in a different colour that doesn't match. But after trying a black tank and black cardigan together for the Fox in Flats Style dare, I wanted to give it a try again with the grey tee and grey kimono. I really liked the way this looked. The style challenge was 'lazy days' and I think this outfit nailed it as reaching for this kimono is starting to become an easy, lazy option, ha! Last worn: Ray-Ban Wayfarers, Somedays Lovin' kimono, pink and grey tee, Jeanswest maternity shorts, Havaianas, Louis Vuitton Speedy Bandouliere. 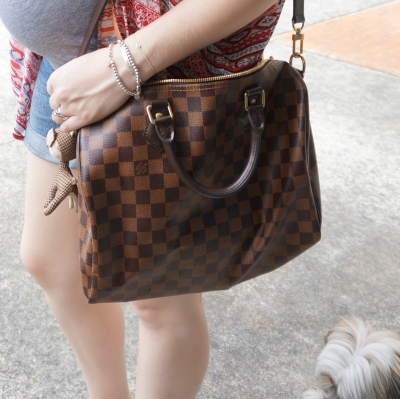 Other ways to wear: pattern mixing with striped tank and printed kimono, pink and grey tee and printed shorts, denim shorts and a maxi cardigan, Louis Vuitton Speedy Bandouliere in the office. The style challenge for the day was 'I forgot I had this' which doesn't really happen in my wardrobe now. After the wardrobe detox session I had, I cut down on a lot of what I own and I know everything that's in my wardrobe. I do have pieces that haven't been worn in a while though, like this kimono and the grey tee, so decided to wear them to meet the challenge instead. Perfect for working from home and attending an OB appointment in the afternoon. 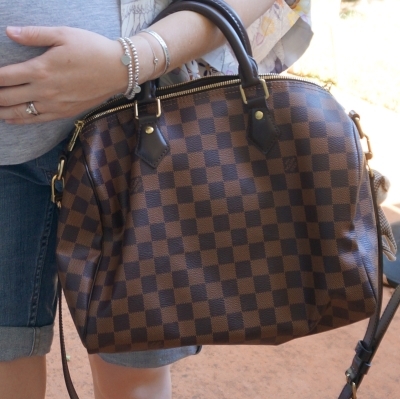 Last worn: Choies red printed kimono, Marc Jacobs tee, maternity denim shorts, Havaianas (above), Louis Vuitton speedy bandouliere bag (above). Other ways to wear: layering a kimono, grey tee layered up for winter, maternity denim shorts and a green tee, Louis Vuitton speedy bandouliere with winter layers. Linking up with Style Me Wednesday, Oh Hey Girl, Throwback Thursday, Fashion Files, Fun Fashion, Fabulous Friday, Stalk Her Style. I love kimonos! They are such a nice light coverup for summer! I have to admit when I wear my kimonos (just 2 or 3) I always tie them and don't wear them open. I like the simplicity of a tee and a kimono worn as an open cardi. I've tried belting them before, but never tying them, I'll have to give that a go next time! I just had one for years, now I've gone kimono-mad, haha! I'm the same - if I find that elusive perfect piece I buy it in all the colours! Mica, I think you look great in grey! I love the spark of color and the prints of the kimonos with your outfit. Looks great together. How beautiful! I love the kimonos :) You look amazing doll! the kimonos are so cute and versatile! You look amazing! Love the kimono. I love the kimonos on you! Make me long for summer days here! haha yep he was happy to be in the frame! I love the grey kimono with the grey tee. You e found the perfect summer combo for both of these looks! Once the weather gets better, I will be investing on kimonos, they just look so pretty! A kimono can make a big difference on the way your outfit looks. Your dog is such a poser (first photo haha). Your posts with these cute kimonos lately are totally making me want one! Love both of these looks and I agree, you really can't go wrong with a gray tee! loving this kimono + shorts style! I'm glad I got some, although I may have a few too many now...ha! I love your outfits with kimonos and shorts, they are so perfect for summer! What cute kimonos! You look adorable. Some beautiful photos babe!! I love the kimonos! Thanks for always being a part of our Friday fun & have a wonderful weekend, Dear! 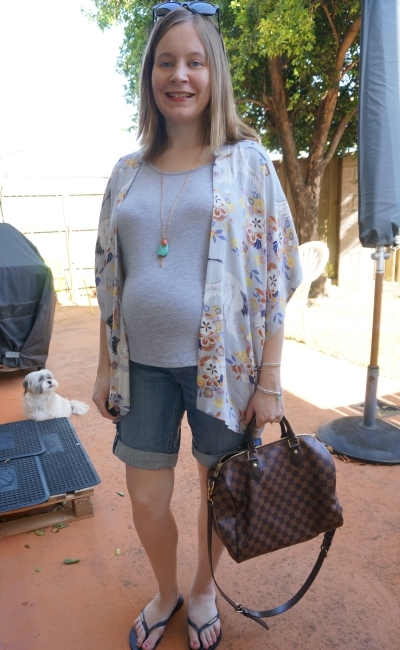 Kimonos seem like the perfect maternity layering item, since you can of course easily wear them postpartum. Yay for more kimonos! I wish I looked as chic as you do during "lazy days." Both these outfits are amazing! Love your kimonos! nice outfit. It's amazing how a kimono or jacket can really pull an outfit together and give it that extra bit of panache - if you can bear to wear it in the summer heat! Definitely! I make sure any I buy are cotton or viscose so that they aren't too warm at all, nice and breathable. I had a polyester one once it was so hard to wear as it was just too warm! I got rid of it! I love how the kimono adds such a fun layer to your outfits! Thank you for joining TBT Fashion link up and hope to see you next week. Have a great weekend! I love both necklaces you're wearing here, they really bring the whole thing together. I am feeling the need for a wardrobe detox session, what with the new year and all that. Any tips you can share? I did a post a while back about my wardrobe detox expereince that might help! :) Basically, find a good impartial third party - even if you don't pay a professional, you need another opinion to help you decide what stays and what goes. It's the only way I was able to make any progress on decluttering, and it gave me lots of new outfit ideas for old favourites too.